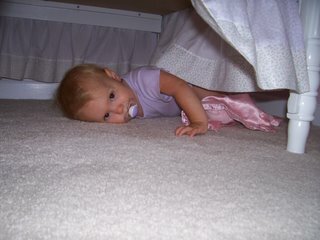 Shiloh loves being chased into her room where she quickly hides underneath her crib. I love hearing her squeals of delight! Now that is explosive cuteness! those are some cute pics! Aw, I want a kid. Thanks for tolerating us barging in yesterday! We all had a good time talking to y'all. No problem! We didn't mind a bit. Shiloh loved you guys! Thanks so much for the Starbuck's card. Hope you and Mark have fun eating that weird stuff tonight!